When was the last time you remodeled your kitchen? Maybe your cabinets could use a change, but you aren’t quite ready for a total transformation? Refacing the cabinets may be an option, but there are other smaller changes that often make a big difference. Give your kitchen a fresh look with a little hardware makeover. Have no idea how and where to start? Read on. It is important to know your needs before you get started. Browse your options and get an idea of the look you’re trying to achieve. You can choose from a variety of hardware options including knobs and pulls, and there are endless options that go with every style under the sun. Previous footprint – When replacing hardware, you’ll need to select a style that will fit back in the same previous holes – including pulls, knobs and even hinges. Consider your style – You don’t want super ornate hardware if the look you’re going for is modern and sleek, so make sure your hardware matches the overall theme of your kitchen. Maintenance – Consider how much you will have to maintain the hardware material that you choose. Some textured pieces and finishes are hard to clean and need more upkeep. If that’s not your cup of tea, opt for a smoother finish. Choose your finish – Select a style and finish that compliments the décor in your kitchen. If you already have a “steel” theme throughout your room, now is probably not the time to switch to gold fixtures. Mix and match styles – Remember, you’re not glued to one specific hardware design, just make sure your choices compliment each other. Function – If you open the cabinet frequently, you may want to choose function over fashion. Choose knobs and handles that are comfortable on your hands when you open the cabinet. Consider cost – They range from as inexpensive as less than $1 per piece to as expensive as over $300. There are plenty of choices to meets your needs. 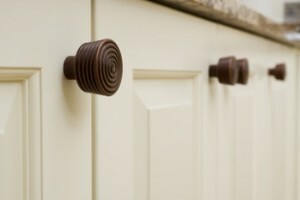 Cabinet knobs and handles/pulls can make a big difference in the look and usability of your kitchen. Take time to choose the best kitchen cabinet hardware to suit your needs. Remember, style and fashion are important but so are functionality and ease of use. Check with your local designer for tips and advice!